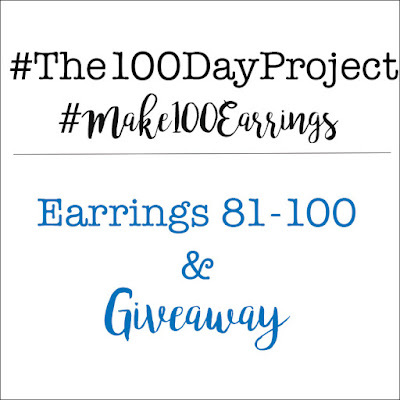 Yesterday, I completed my last pair of earrings for #The100DayProject. This project started on April 4th and encouraged creators to pick a project to work on/complete each day for 100 days with the intention of fostering more creativity. These projects were to be featured on Instagram with the project's hashtag and our own unique hashtag. 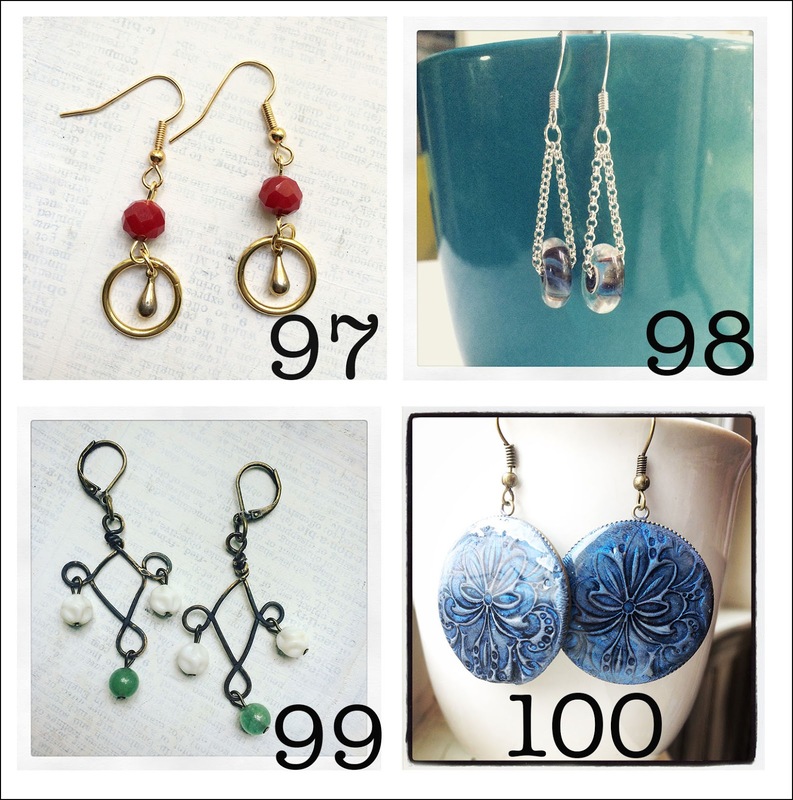 I chose to make a pair of earrings, using #Make100Earrings. As I said, yesterday was day 100. Previously, I've revealed earrings 1-20, earrings 21-40, earrings 41-60, and earrings 61-80 along with a giveaway for each set. I have to admit that I went into the project fully expecting myself to fail miserably. I didn't think I would make it near 100 days. I did miss two days while I was out of town during this bunch but made them up as soon as I got home. 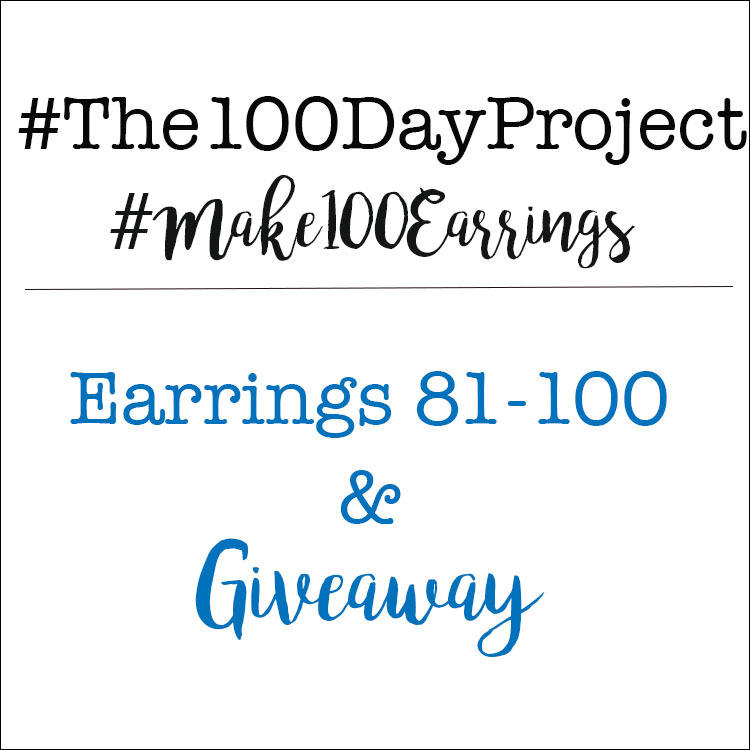 So, in the one hundred days...I made one hundred pairs of earrings. I can't even believe it. As I said above, the purpose of the project is to garner creativity by repeating a similar piece of work day after day. This repetition forces the individual to step out of the box rather than become mundane. I found this forced creative innovation to be true for the most part. Though, towards the end, I began to feel like all my ideas had run their course. 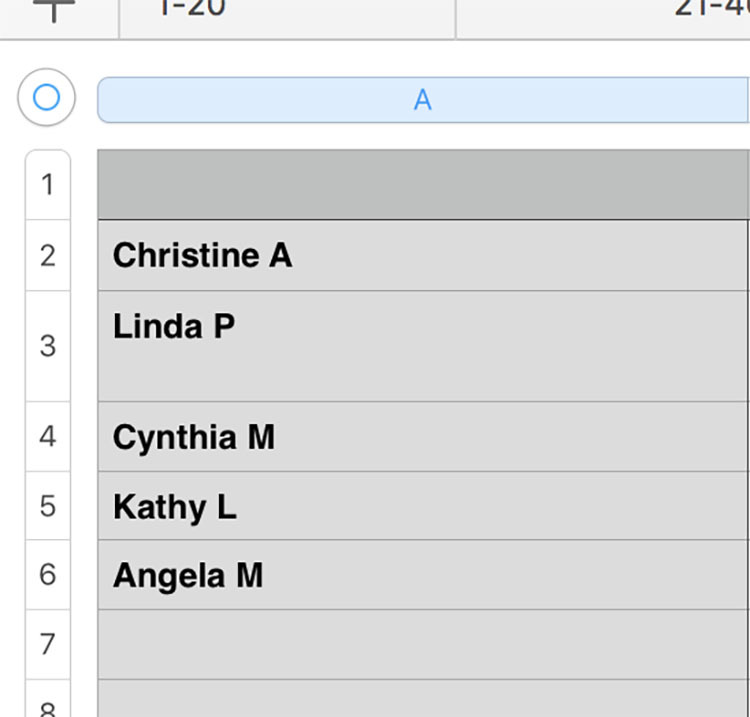 A hundred days is probably the perfect number before the project becomes tiring. In any case, I present you with the last of my contribution to this year's project. Day 81: I don't even remember what I had on my desk previously, but I distinctly remember getting frustrated that it wasn't working out the way I wanted. Rather than continue to fiddle and fume, I stacked some beads on headpins. These turned out beautifully. Day 82: After creating my own stencils with my Silhouette Cameo and page dividers, I traced the same shape onto some tin. From there, these teardrops were cut and sanded before being hung from the small coral beads. Day 83: I've hung onto a couple of rolls of thin metal I got for cheap forever ago. It hit me that the metal was thin enough to be run through an embossing folder. From there, I aged the metal with patina, cut it to fit in the bezel, sprinkled on mica powder, and sealed it with Magic Glos resin. The violet beads are salvaged from old jewelry and flanked on an eye pin by copper spacer beads. Day 84: The flower fairy beads from Mermaid Glass have been in my stash for ages. I love them too much to use them...or some such nonsense as that. They're accented simply with bead caps and tiny Chinese crystals and moonstone-colored glass beads from ZnetShows.com. Day 85: Using random scraps of leftovers from cutting apart the tin days before, I paired up the pieces and hung small amethyst briolettes from the bottom. Day 86: For some reason, the polymer clay discs caught my eye. I was working from my travel box so I dug around for coordinating beads and came up with this combination. Day 87: When I came upon a list of earring idea for this challenge, I noticed that I had made all of them except for one that mentioned these tiny spools. A few wood discs were added to the top and bottom since the holes were so large. As well, I glued on embroidery floss to add color. 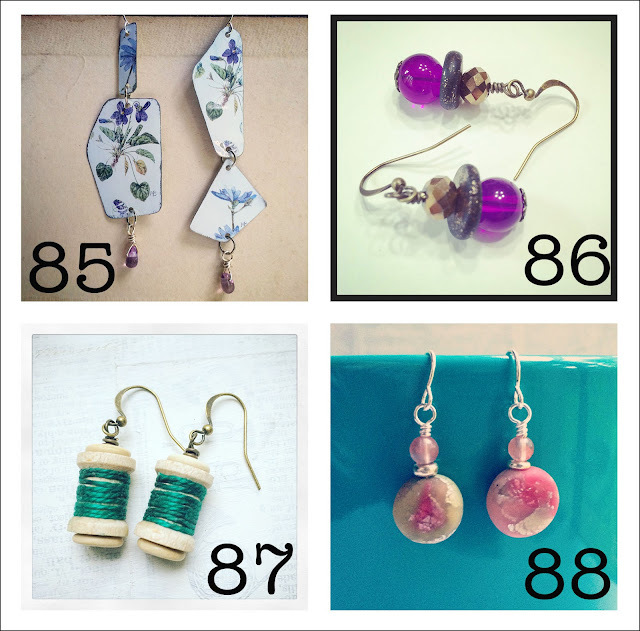 Day 88: At the end of an extremely busy day, I thought I had already made my earrings. Once I realized I hadn't, I dug around in the craft room for something, anything different. These mokume gane polymer clay beads that I made eons ago were unearthed. I paired them with silver spacers and cherry quartz-colored glass beads. Day 89: It was another long day. The beads for these earrings were in a small bowl on top of my bead cabinet waiting to become something. Earrings, they became earrings. Day 90: We had another day spent almost completely outside, and I just wasn't feeling inspired. Finally, these came together. And, looking at the one on the right...it seems that maybe I cut the bottom wire. These will have to be re-made! I might even make them less sloppy. Day 91: With summer in full force, I was drawn to these cobalt blue cultured sea glass conch shells from ZnetShows.com. The Czech glass beads I used with them have a feeling of sand to them. Now I want to head down to the beach. 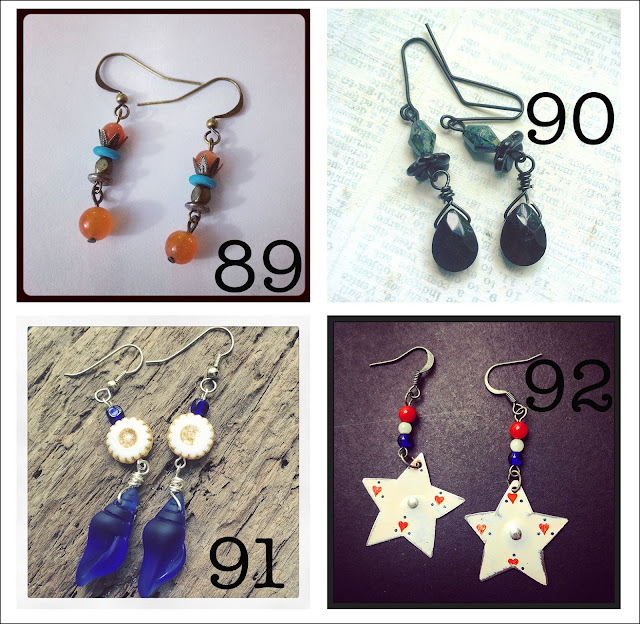 Day 92: It was the 4th of July, and I wanted to make red, white, and blue earrings. I recalled that one of my tins used that color combo. To keep the patriotic theme, I cut the tin into star shapes. They're too cute! Day 93: I left out of town EARLY that morning. Late in the evening, when we finally checked into the hotel, I was just climbing into bed when I realized I hadn't made my earrings for the day. I quickly pulled together some of my altered and patina-ed Vintaj blanks and faux blue pearls. Day 94: The size of these faux pearls are what got my attention. However, I wanted to make them dainty. The use of bead caps and the airy rings finished this pair. Day 95: Inspired by my niece, my best friend, and the star beads; these earrings took me a little while to decide on. But, they fell together once the decisions were made. Day 96: Here's where things went wonky. I was still out of town and didn't have a minute to myself. So, these were actually made after I got back home. The discs are mica washers and are paired with pretty blue glass beads. Day 97: Like #96, I had to make these late. 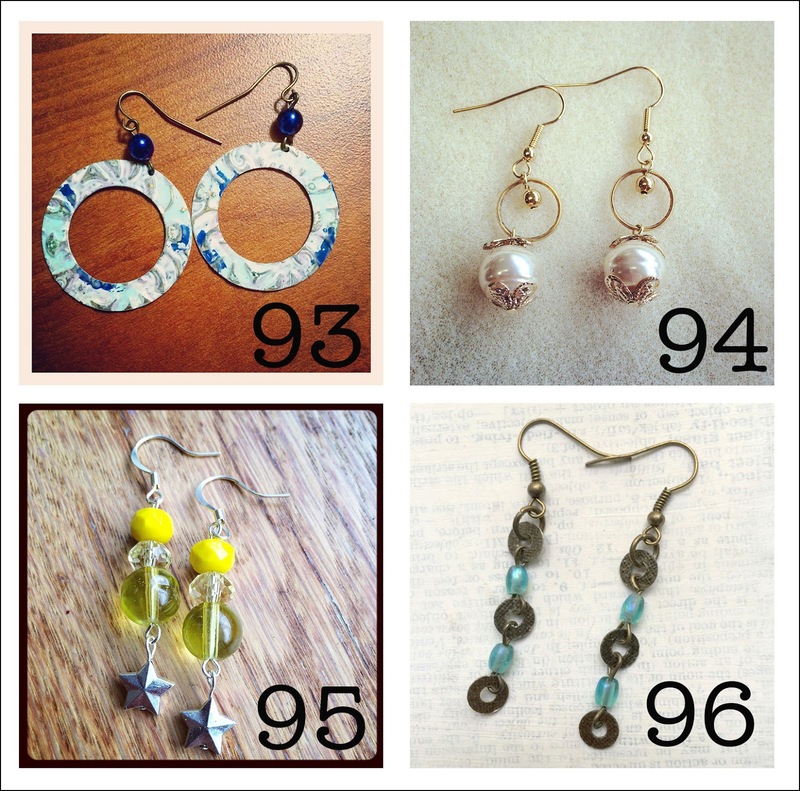 The metal teardrops were unearthed in one of my little drawers and were the inspiration for the earrings. They're pretty much a take on earrings #94, but with a bolder statement. Day 98: The lampwork spacers in these earrings are from StudioJuls. Once I realized a small chain would slip through the holes, these seemed obvious to me. Day 99: I was drawn to try to make a chandelier frame with wire. There are worse versions of these. While these are not fabulous, at least I tried and know what my weakness is. I'll try this technique again another time. Day 100: Wanting to go out with a bang, I decided to a new approach entirely. I pressed conditioned scrap polymer clay into shallow bezels, stamped an image, covered it with mica powder, and baked the clay until cured. From there, acrylic paint gave accents and shadow before the whole thing was sealed with resin. They're stunning and make me wonder why I hardly every work with clay anymore. Angela, that's you! I'll be sending you an e-mail soon about getting your prizes to you. Congrats. 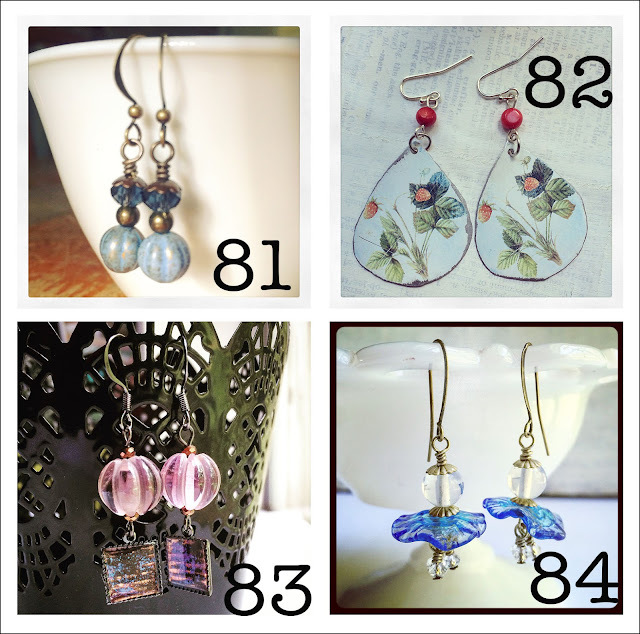 If you're interested in entering the new giveaway to win some of the earrings from this current selection, leave me a comment letting me know which of these earrings are your favorites. I do ask that you live in the US and leave me your e-mail address with the comment. I'll have this giveaway open until the end of the month and draw a winner at the beginning of August. Thanks for checking out what I made and for playing along. Good Luck!! this is sooo cool! "Day 83: I've hung onto a couple of rolls of thin metal I got for cheap forever ago. It hit me that the metal was thin enough to be run through an embossing folder. From there, I aged the metal with patina, cut it to fit in the bezel, sprinkled on mica powder, and sealed it with Magic Gloss resin. The violet beads are salvaged from old jewelry and flanked on an eye pin by copper spacer beads. " as you said, you have to think outside the box, being immersed in the same thing day after day, and that creativity breeds creativity! you've proved that over and over. and stamping in clay? I'm impressed with your impressions! LOL! wish I could take a class from you!!! I love all the blue ones, but #100 might be my favorite. You really did go out with a bang. As I do not live in the US, I cannot participate in the giveaway but I wanted to comment to congratulate you. You indeed set a goal for yourself and followed it through. Not just that you made interesting, unique pieces almost everyday. I really enjoyed this series. Congrats on reaching your goal. I have to say I am taken with pair 100. I am wondering if I could make something like that. I have a ton of polymer clay that I haven't touched in months and a pile of bezels that are also untouched! Thank you so much! It seems that #100 might be the favorite all around here. They really were pretty easy to make - just quite a few steps to get them done. My clay hasn't been touched in years (since we moved)! I got rid of a lot of my clay supplies at a yard sale before we moved, but did keep some scrap clay just in case. I'm glad I did. I even used my kitchen oven to bake the clay as my craft toaster oven is put away in a closet. I might have to clear out a spot for it in the craft room since these turned out so well! Thanks for your vote of confidence. I love them all but, I love you more! Awwww, my sweet girl. I love you too and miss you bunches! Great job keeping up with the challenge for the full 100 days! I'm not at all surprised that you had to make a couple of them late because of your trip. 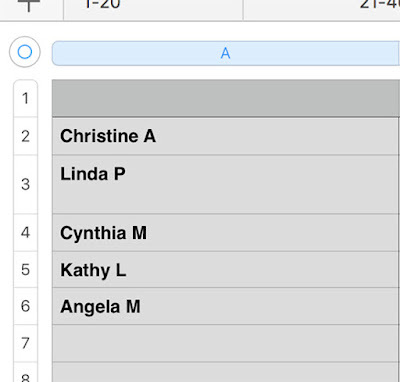 You're always so busy on trips with the nieces, it seemed inevitable. My favorites from this batch are probably 81, 83, 85, 97 & 98. Pezz, The whole reason I even made the travel box in the first place is because I knew I would be out of town for that portion of the challenge. It was just a busy few days of go go go that I didn't get a minute to breathe. But, I did catch up before day 100, and that makes me happy! Congrats Hope, this is a big accomplishment! They are all wonderful!! I like 100, 91, 92 oh ya know I like them all. Gosh, I have loved watching you make all of these. I am really sad to see it come to an end but I can understand your relief. As I open a new set of pictures I find myself going "I like 81, oh but 83, oh 82, but then 84. I also love 91 and 100 is extra grand. I am definitely drawn to the blues. Hope, your art style is wonderful and very creative as we have seen now for 100 times. I also like your writing in your blog and look forward to reading more. PJ, The blues are my thing for sure. I can't resist them either. Thank you so much for following along and for the encouragement! I think this challenge gave me some much needed inspiration and brought me out of my shell some too. It showed me that there's enough time in a day to accomplish some creativity, if only I make time for it. I hope I showed that to those who followed along as well. Hurray for your persistence and inspiration, Hope! It was an interesting journey for me, too, following the designs and how they came together! I am sure you will keep counting the benefits from taking part in this challenge, like expanding the materials you have used and made!